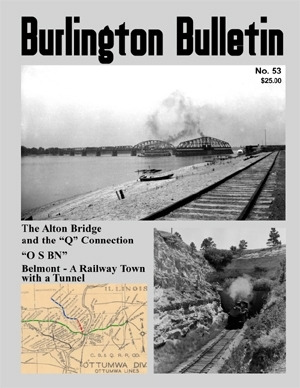 Burlington Bulletin 53 in the mail! Burlington Bulletin 53 was mailed from our new printer in Pontiac, Illinois, Thursday, May 11th. It is a three topic issue consisting of the Alton Bridge, Belmont Tunnel and OS BN. This is the first issue from our new printer and a change in how the Bulletins and Zephyrs will be mailed.